Always be sure to sew your ribbons securely. They will not only help to keep your shoe on your foot, but will also support your ankle while on pointe. You can choose to also sew elastic from the back of the heel across your ankle if you wish. Use a strong thread or dental floss to sew the ribbons and elastic. Cut the ribbon into 4 equal lengths of about 22 to 24 inches. To see where you should attach the ribbons,fold the heel over the inside shank, toward the sole. Where the edge of the heel meets the drawstring casing is where the end of the ribbon should go. (See right.) Mark this place on each side on the inside of the shoe with a pencil. 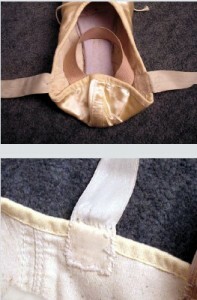 Sew the ribbon to the shoe using overhand stitches along the top near the drawstring. Then continue around all four sides so the pattern resembles a box. Try to only sew through the canvas lining of the shoe so that your stitches do not show through the satin exterior. Be careful not to sew through the drawstring. Repeat with the other three ribbons. If you are using elastics: before cutting the elastic, put your shoe on, and measure the elastic across your ankle so it’s comfortable. It should be snug, but not too tight. Sew the ends about a 1/2-inch from the heel seam. How you break in your shoes will become a matter of personal preference as you get used to what you need in your pointe work. Most dancers like to flatten the box slightly and also soften the shank (the sole of the shoe) slightly by bending it by hand gently, about two inches from the end of the heel. Do not over-bend it as you don’t want it to break when you stand on point. get at the drugstore—on the sides, by your big toe and little toe joints. With the shoe on, wrap one ribbon across the top of your instep and then around your ankle. Keeping the first ribbon snug and flat, wrap the other ribbon in the other direction across the top of your instep and around your ankle. Make sure that the ribbons aren’t pulled too tight,but are tight enough so that they’ll hold the shoe on firmly. They should also not wind too high or too low up your ankle, but sit just above the ankle bone. Bring the ends of the ribbons together on the inside of your ankle and tie them into a small knot. Be careful not to tie the knot over your Achilles tendon on the back of your ankle. Once you’ve decided which shoe will be most comfortable as the right shoe, and which as the left, you should trim the ribbons. Trim the ends (it’s usually best to cut them on a diagonal) so that there is about two inches beyond the knot. Once the ribbons are trimmed, fold them down neatly and tuck the ends under the rest of the ribbon so that they can’t be seen. When dancers perform in pointe shoes, they often sew their ribbons down so that the ends don’t pop out while they’re dancing. shoe on your foot, but will also support your ankle while on pointe. You can choose to also sew elastic from the back of the heel across your ankle if you wish. Use a strong thread or dental floss to sew the ribbons and elastic. get used to what you need in your pointe work. Most dancers like to flatten the box slightly and also soften the shank (the sole of the shoe) slightly by bending it by hand gently, about two inches from the end of the heel. Do not over-bend it as you don’t want it to break when you stand on pointe. You may also want to soften the sides by the joints of your toes, so that you can stand on “half-pointe” on your way to full pointe. While you have the shoes on your feet, drip a small amount (a capful is enough) of rubbing alcohol—which you can get at the drugstore—on the sides, by your big toe and little toe joints. The first time you tie your ribbons, you may find that you need to trim the ends. Do this only once you’ve decided which shoe you prefer for the right foot and which for the left. Once the ribbons are cut, the shoes will have a “left” and “right.” With the shoe on, wrap one ribbon across the top of your instep and then around your ankle.